I hope you know to create slide shows and themes in Windows 7 desktop . These slide shows make use of a set of specified wallpapers from PC . 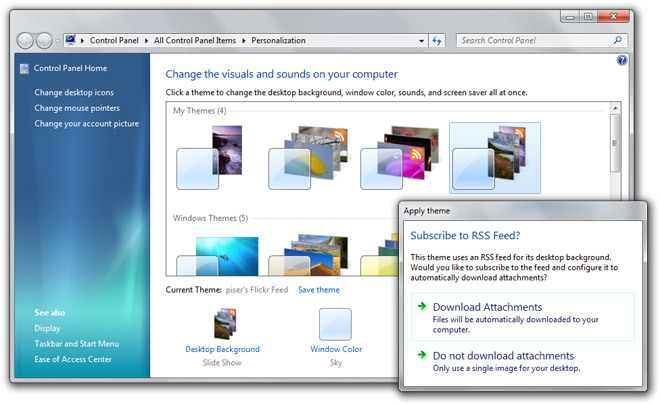 There is a new feature in Windows 7 that could be used to specify RSS feeds for desktop slide shows . 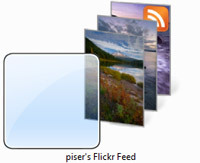 So you could use your Flickr or other RSS streams to build a slide show theme in Windows 7 . If you replace it with an RSS feeds . Check out thispage to know more about theme structure in Windows 7. You can read this article create windows 7 themes . After creating a .theme file , open it using a text file and change the above parameters . After RSS feed theme installation , it would take certain time to load all the files from internet . The current build of Windows 7 has some problems related with the feed refresh time and RSS feed option in personalization control panel .This would get fixed in upcoming releases . 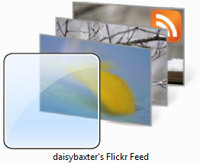 Istartedsomething.com has created few RSS feed slide show themes in Windows 7 using high quality Flickr photo feeds . Enjoy RSS feed slide show themes in Windows 7 .